Numbers for Mac has always occupied an awkward position. It’s not powerful enough to replace Excel or Google Sheets for many business purposes, and it’s designed partly to be an interaction, quantitative-information presentation tool. Numbers for iOS had even more of a bias towards presentation until the latest update brought it a little more power. However, Apple keeps pushing forward, and Numbers 5 for Mac has only a single significant change that Apple mostly underplayed, as most of the changes improve feature parity and seamless interchange between Numbers for Mac and iOS, while also making the apps more consistent with Pages (Mac and iOS) and Keynote (Mac and iOS). 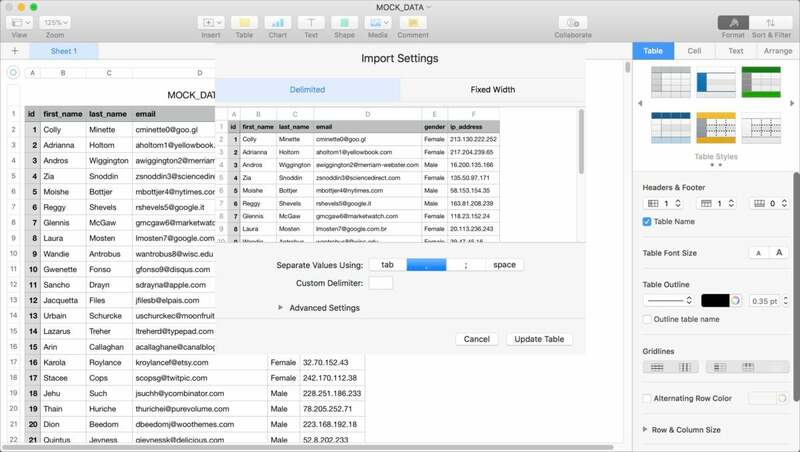 The big macOS change is relatively boring but very practical: the ability to import field-based data exports from databases, apps, and web services. Until now, Numbers lacked any useful way to control how it parses information that needs to be plopped into columns and rows. You relied on whatever defaults and assumptions Apple made. If your data didn’t conform and you couldn’t modify the output of whatever program app or service you used to meet it, you’d have to manipulate your exported data in yet another piece of software. That’s now in the past with Import Settings, an option that appears when you click Adjust Settings after you open a text file that has formatted data in it, whether it’s in comma-separated values (CSV) format or a fixed-width text format. Technically, you don’t even have to use CSV format any more, as you can adjust to use tabs, spaces, semicolons, or a custom delimiter. New Import Settings ease the process of massaging data from disparate sources into Numbers. The Adjust Settings button is a little bit irritating, as it appears very briefly. The moment you engage with the spreadsheet, it disappears, and you have to re-import the file to get the option back. Import Settings also appears when you paste text into Numbers. Previously, you had to rely on Numbers automatically interpreting and massaging that import, although it tended to do better with pasted text than text in a formatted file. I tested copying a variety of tables from Web pages into Safari, and Import Settings definitely provided far better results. However, Numbers 5 no longer handles certain formatting and wrapping issues correctly when pasting that the previous release did. If you commonly copy and paste from a browser, you may find Numbers 5 adds a text-massaging intermediate stage, or at least until Apple releases an update or adds additional formatting options. As with updates to the other iWork apps, Numbers gets donut charts, new insertable shapes that can be edited, and support for collaborative editing via the third-party Box document-sharing service. And Apple offers a way to reduce storage consumed by audio, video, and images embedded in the document by opting to downsample or use more efficient formats (via File > Reduce File Size). Though seemingly a little out of place, you can also insert an image gallery into a Numbers sheet, just as in Pages, although you can only move through these images within a Numbers document. There’s no way to export it for interactivity. Numbers 5 for Mac advances the app, making it more useful for more purposes with less effort, but it’s still a shadow of full-feature business spreadsheet programs. Nonetheless, the set of improvements in the macOS and iOS versions make your work easier in shifting back and forth and getting the most out of the numeric and presentation sides of the software.